The term “all in” seems to be one we find cropping up more often in peoples vocabulary these days but what does it mean? How do we measure it? How do we prove that we have done it? Tricky one right. It was these thoughts I was having in the lead up to the Mt Sana 60km trail race on March 22nd. I wanted to go “all in” but I needed to define that. In trail racing there are so many variables for you to manage some that you control and some that you don’t, the races can be hours long and it can be as I have often described a “roller coaster” ride. I quickly got my definition in my mind and split it on 3 levels. Firstly I would be fueling my body based on being pretty much in the “red” for most of the race, this would avoid me from looking down at my watch and seeing my heart rate being high and thinking I have to adjust. Secondly I would run the flats at a pace I knew challenged me but I knew I could do if I wanted it enough and use my strength to climb and descend like a the light mountain goat I am so far from at my 91kg. And thirdly I remembered some words that we in my documentary Fight for Every Breath which screened 3 days before the race in which I said “everything was easy compared to what I had been through”. 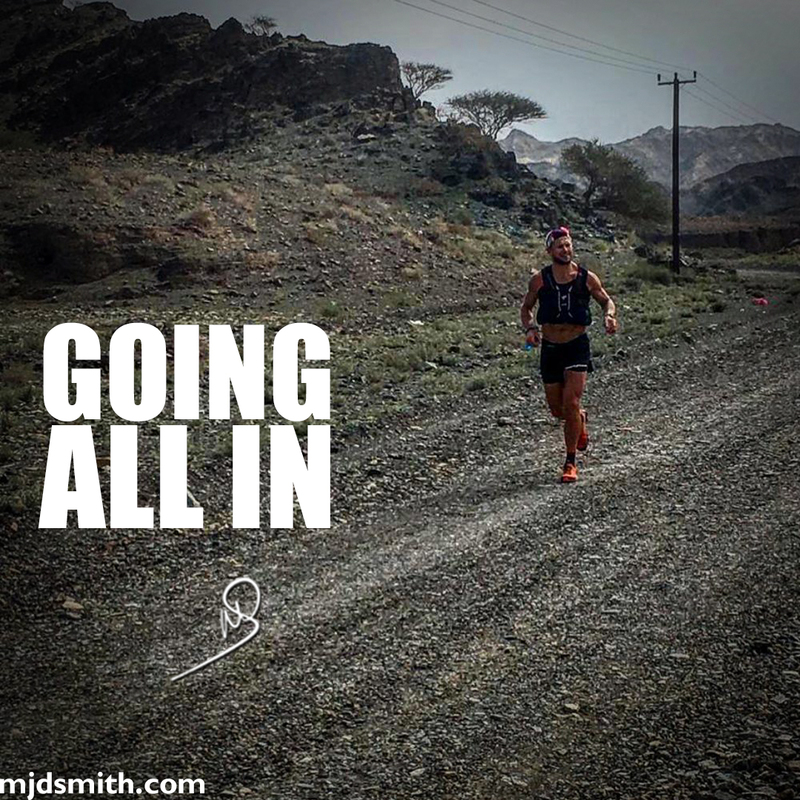 Not knowing who may turn up to these races and not wanting to create unnecessary pressure I never think about where I am going to finish and the fact that I have my “All in” dialed in means my expectations are set. I am ready. The night before the race we chose to camp by the start line. Lovely place, super peaceful and a nice camp fire. I love sleeping out under the starts. Tonight was special, mosquitos that tortured me for the fist 5 hours before the rain came. Perfect race prep? Not at all. This could have crushed me but I fed off it, when I got out of my rain soaked mosquito infested sleeping bag just before 4am I was as pumped as I have ever been before, dancing, singing, fired up to the absolute max. I was ready to go “all in”. I knew what the first 8km of the course had to offer, 5km of flat then a very technical 3km climb into a mayhem descent. I had walked it last year as a spectator and wanted to attack this section, not the other racers, but the course. I ran hard to the climb and then kicked into “Run Strong” mode as I powered up the first climb. The start of these races are funny as you kind of see who has flown off but as there was a 21km race as well as the 60km race I had no idea who was doing what. It is marked on peoples race bibs but the darkness and rain at 5am made seeing that marking a challenge I was not ready to spend energy on. Checkpoint 1 and I am having the time of my life. A lot of people spend too long in check points, this was a short race and I knew that refilling water was all I would be doing and getting the hell out of there. I was gone quickly and onto a 10km hit of relatively flat jeep track. This is my weakness compared to the lighter guys as they are able to run faster on these parts and make time on me. My “all in” was to run hard here so I got my mind in gear holding my place (although I had no idea what it was) to checkpoint 2. Checkpoint 2 brought light to my eyes as we headed back into climbs and technical trail. Whilst no one had passed me on this stage a few runners had caught me. One of them was Meryl who as she ran up to me said something probably better off not repeated but in simple terms “come on lets smash this”. Solid words 20km into the race as we headed at light speed up and down some very technical climbs and into another flat section. Having someone to run with that’s a good dude on the flats helps a lot. At one stage Meryl said to me “you know we are running at sub 5 mins a KM?” to which I replied “yeah, feels ok huh”. We kept the pace to the next checkpoint. It was here that Meryl’s race started getting interesting on 2 counts. Firstly we were very close to the other top female in the race, it would be down to her and Meryl to take this race and secondly she started to have some plumbing issues. A few KM out of checkpoint 3 we caught up to one of the males. I still had no idea what position were were in but had seen about 6 names on the checklist at CP3. Being halfway into the race you still don’t want to think too much about placings but I was feeling unreal and my mind started to wander. As it did we were hit with another technical section of boulders and as I revisited my “all in” I scampered from rock to rock, without noticing it leaving Meryl behind. I was on my own and pumped. I remember hitting another section of flat and looking at my watch and my pulse was 160. Normally I would pull back to control it on the flat but instead I smashed in another gel and held the pace just over 5 mins a KM. That pace soon brought another male into my sight who I could see was going pretty strong so I sat in about 50m behind him on the flat for about 4km. We still had 25km left, this race was young, I didn’t need to attack yet and I know it’s always harder having someone this close behind you so I sat there on the same pace with the same gap. He kept a strong pace and occasionally turned round to see where I was, right here! I knew we were approaching the 44km checkpoint and I thought this was my chance. The chance to run through him by not stopping at the checkpoint to refill water. I quickly checked my course guide and saw the next checkpoint was at 50km so I would need to go 6km with the water I had which was 1 liter. It was a risk, a huge risk as I was pretty sure in that 6km there was a solid amount of climbing. At the same time I knew what it would do to this guy mentally if I just ran through the checkpoint, he would think I was fresh and getting stronger and that could be my battle with him won. From 44km to the 50km check point on my 1 liter of water the track went up, got more technical and the sun brunt through the rain soaked clouds we had enjoyed this far. Still not knowing how many other runners were ahead of me I pushed, it was “murder mode” now. I had a huge energy boost from moving up a place, the mental aspect of what I did helped me a lot. Heart was exploding, I was smiling, loving my life, 15km to go, “this is it” and as I turned a corner on some narrow goat track I saw another dude a few hundred meters up the way. “Whaaaaat” I thought to myself! What position is he in? Is there are race on here? I powered up to him and as I arrived he turn round and shook my hand and told me to go get it. Go get what I thought? Was this the leader? There was no time for questions as I shouted “come with me bro” as we started a wild technical decent at speed. I had no consideration for my body, my safety or anything as I hopped from rock to rock often kicking them and scratching my legs on low lying shrub. With the decent over we hit a flat section and the guy was still with me. We are 3km out from the final check point, I am basically out of water and this guy drops the pace! “Race time” I am thinking to myself, this could be fun. He hammers it and I hang on for dear life, the sight of the check point is a massive relief but it’s about 800m ahead. Two laps of the track i think to myself as we are running 4:30 a km. Pulling into the check point I think to myself that this final 10km is going to be one of the most epic battles of my life, one I had no desire to lose. And with that thought the guy turned around to me and said “great race mate, I’m done, go get him” as he offered me 2 high fives. Almost in a state of disbelief as to what’s just happened I filled my water bottles and ask the check point crew how far the leader is up the road. “7 mins” is the reply as I leave the check point for the last and most brutal 10km of the day. In reflection now that race into the final check point was epic, I am not sure if they guy was trying to test my legs or just have fun but it certainly punched me hard and I felt it in the first few km of the final stage. I was now in hell, everything hurt, 7 minutes seemed way to much of an ask to catch the leader of the race, what could I do? What should I do? Then I remembered how easy this was compared to when I was fighting for oxygen on the side of the road after my crash last year and I upped the anti. I didn’t close the gap enough and ended up with 2nd place just 6 mins behind the winner as I crossed the finish line in 6 hours 16 minutes for the 61km course. A few moments after my finish similar feelings that I had experienced in other races and events that I had done that took every single ounce of me washed over my body and mind. I had gone “ALL IN”. Sadly on that day my all in was not enough to win the race, respect to the guy that beat me, you were outright just better. I will look back on this race as one of my better ones, things went well from a nutrition stand point which is key in ultra, my legs were strong but more than those things my mind was in gear for the whole race, I didn’t care, I had set out what my “all in” was and I was making it happen. Yes it hurt, yes it was hard, it is supposed to be, that’s what “all in” is supposed to feel like. What a great day! How I fueled my race? Yep it’s a lot of food. Ultra continues to be a test of who can eat the most apparently!